I have a natural devotional feeling towards Ramana and almost all of what he says strikes me very authentic and real. However I have a hard time feeling any kind of devotion towards Arunachala, Shiva or a few things... Now I don't mean I have a feeling of aversion or negative feelings or anything, just more of a neutral feeling. Perhaps in time I will develop devotional feelings toward Arunachala... but at the moment it seems like I'd be "faking it" to pretend I do. Any recommends for a Westerner to help understand what Arunachala really means / is? Also is there a list of "authorized" or genuine Ramana publications or organizations? There seem to be an endless amount of Advaita teachers these days and I have no interest in anyone other than Ramana. Is there a list of authentic, approved Ramana organizations or publications? I come from a Catholic background, too. I feel a natural devotion for say, St. Therese of Liseaux, but then again I part ways from the Magisterium on many points... for example what can one person possibly do in a finite lifetime to deserve eternal damnation? etc. etc. In my view Advaita holds the secret behind all religions. The most simple and pure version. a non-Hindu, it might be difficult to accept. So is Arunachala. within and this would do to start with. including many Westerners, these are available in Sri Ramanasramam. These would give you further insights. California, 95060 U.S.A. Ph: 831-425-7287. Sri Subramaniar R will perhaps reply satisfactorily to most of the questions you have raised in your posts. However, I wish to say that, in my view, coming to Bhagwan Sri Ramana is the greatest good that one can ever aspire for in this temporal life on this otherwise beautiful planet. You can rest assured that time, space and religion are no barrier to come to such an exalted Guru as Bhagwan Sri Ramana. Dear Sri Om hridayam, when a western devotee lamented, on the eve of his departure away from India, that how would he then be able to soak in the Presence of Sri Arunachala, living in a far away country, at such a vast distance away from Him. Sri Bhagwan reminded him that Sri Arunachala is within you. How can you be away from Him ? Yes, Sri Arunachala is the sacred and the secret Heart-Centre of the all pervading Lord Shiva Himself. Sri Arunachala is the Supreme Consciousness and verily our own 'True Self. With perseverance everything will, by the Grace of the Guru, come to you naturally as it has been for so many devotees. There is no doubt it in my mind whatsoever. religious faiths came to Sri Bhagavan. Many were Westerners, either Catholics or Protestants. Bhagavan Sri Ramana recommended change of faith for any of them. Some of them after spending a few months with Him, started asking Him whether they should become Hindus. Bhagavan Ramana smiled and said: Why? Is it not Atma common to men and women of all faiths? You can be a good Christian and still do Atma Vicharam, Self Inquiry. He also said the same thing to many Indian Muslims who came to Him. he was also blind but could recite the entire Koran. He was impressed by Atma Vicharam and spent some time with Bhagavan and left for his place. So was with food habits. Bhagavan recommended sattvic [vegetarian] food in moderate quantities. In the Asramam, it was the practice to serve only vegetarian food. There was also an unwritten rule that inside the Asramam premises, no one should take non vegetarian food. But many Western devotees could not leave egg and chicken and they went to the restaurants and took such food and then came back to the Asramam to listen to Bhagavan's words. Arthur Osborne was a classic example. For many years, he could not leave non vegetarian food. But after many years he became wholly vegetarian. Major Chadwick was an exceptional case. He was a vegetarian even before coming to the Asramam and continued to remain so. Regarding Arunachala and circumambulation. Going round the Hill by foot without slippers is considered an auspicious thing even today. But Bhagavan Ramana did not recommend this to all. and Western devotees started doing what is called pradakshina. Major Chadwick observes: "I used to sit on an easy chair and watch the Hill. Over a period of time, I understood that the Hill is something special and not like any other Hill. It is magnetic. It is attracting the souls as God attracts the souls." The Hill is something very special. It is [geologically proved] one of the oldest Hill that came along with the formation of globe. It must be God's own earth. Thanks to everyone for taking the time to help. Again, thank you all for your time. My wife has no ill will towards Ramana or any other religion for that matter. Sorry to hear about your difficulties on that aspect. You feel (or have felt) no love towards any of the saints? Odd. Most Catholics I know have -some- saint they resonate with. (If I understand you correctly) I see from your myspace page that you are into Rajneesh/Osho? Perhaps that is where you get those ideas? Rajneesh treated some of his own people) Also Adi Da had these ideas and forced people to do things that were terrible for his own amusement. I do not believe that "Going your own way" is worthwhile unless you have a solid understanding of that way being the one Self. If you understand that everyone is that Self you would never treat them so badly. That is the problem of "your own way" as preached by the neo advaitins. of a seductive, hedonistic argument." If I am misunderstanding you I apologize, but that is my same observation of most neo-advaitins. This story is of interest to you. having some doubt for clarification and inspected the items inside that cottage. No meat, no meat packet, no remnants in dustbin! He came and reported to Bhagavan Ramana. 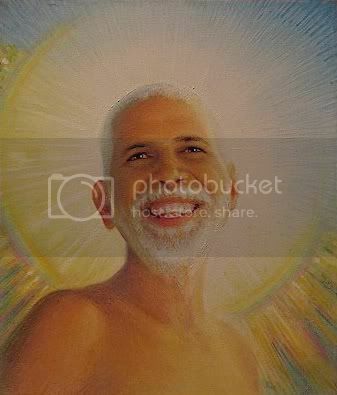 Bhagavan smiled and said: "I know...I know... but for these people's sake...."
"Now, who is going to dismiss these two?" "You are my merit. You are my deficiency. I do not care for both. I only want abundant love to your golden feet." Ahhhhh That story is superb! Very, very funny. Thank you. mai_chop_gohok: "The line" is not something I am determining for you. What I was talking about was my response to them. I do not see them as being the same league as Ramana or even close. with pretty much what every scripture has ever said. The Neo Advaitins are echoing -parts- of what he said, but if you read my earlier post the critique is, again, and I quote: "In effect Neo-Advaita gives the ego licence, without attenuation, to live on under the justification of a seductive, hedonistic argument." Ramana lived very simply and fed everyone who came to him. Rajneesh had 365 Rolls Royces -for himself-... see the difference?